Crafters Deluxe 2-in-1 Hot Knife/Sculpt Kit - Dino Rentos Studios, INC. 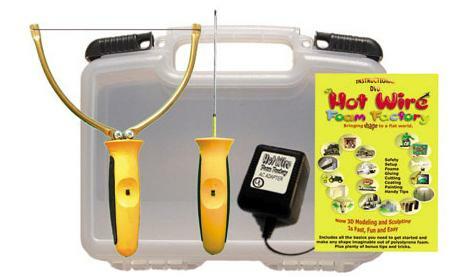 The popular Sculpting Tool (with 6 wires), 4" Hot Knife, Crafters Power Supply, and 90 minute Hot Wire Foam Factory DVD, all in a handy carrying case. Plunge, Slice and Dice! The 4" Hot Knife is the foam cutting tool the world’s been asking for. A combo hand held scroll saw and power drill that cuts foam with fast clean surgical precision. The 4” blade is made from thin tough steel, with a unique round shape that slices quickly and cleanly in any direction like magic.